station has been stunningly renovated to display the national collection of 19th century masterworks featuring paintings by the Impressionist works once housed in the Jeu de Paume (now featuring temporary exhibits of modern artists) were moved to their new home which opened in 1986. Touring the d’Orsay we can find your favorite artists masterworks. Popular artists like Manet, Renoir, Degas, Monet, Van Gogh, Toulouse-Lautrec and many other can be shared and enjoyed. We can learn more about this exciting era of art history. Make an Impressionist Day with a visit to the d'Orsay Museum and a visit to the neighborhood of Montmartre. A walk through this former village outside of Paris can still offer up the charms as the habitat of the revolutionary young Impressionists. Many of the landmarks painted by the Impressionist artists can still be seen today. They would include the cabarets the Moulin Rouge, and Au Lapin Agile. 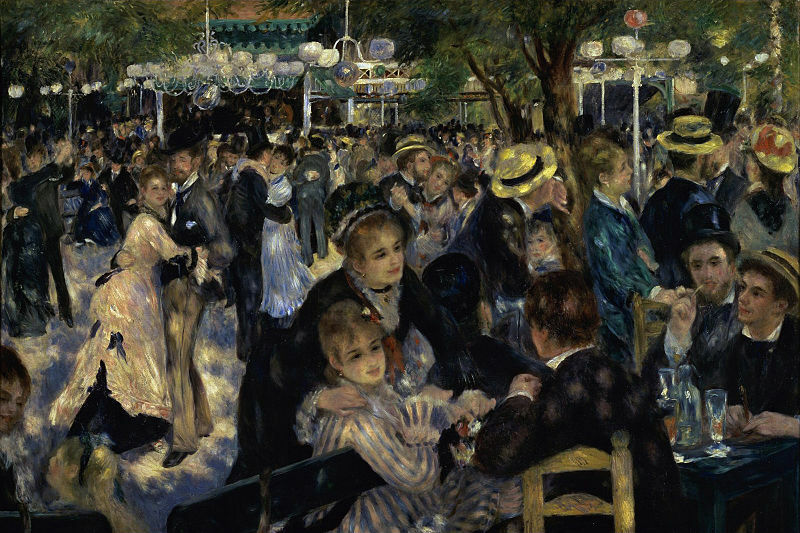 Renoir's painting "Moulin de la Galette" hangs in the Musée d'Orsay. This former functioning windmill can still be seen in a visit to Montmartre.